I am one of only three sophomores on the biology trip to Yosemite. The remaining are seniors and they are not shy about their dislike of me being on the trip. It hurts, but I don’t care. I am too excited. We track wolves, sleep in a log cabin, snowshoe and slide on our bellies through a pitch black cave formation called “the birth canal.” These experiences are unlike anything I’ve done before and I feel a joy so big it vibrates my entire body. “It’s so beautiful, like I’ve fallen into a storybook,” I cry out. I throw back my head, close my eyes and breathe in the cold piney air. “You are such a child,” I hear one of the girls say. A picture from my trip to Yosemite in 1993. 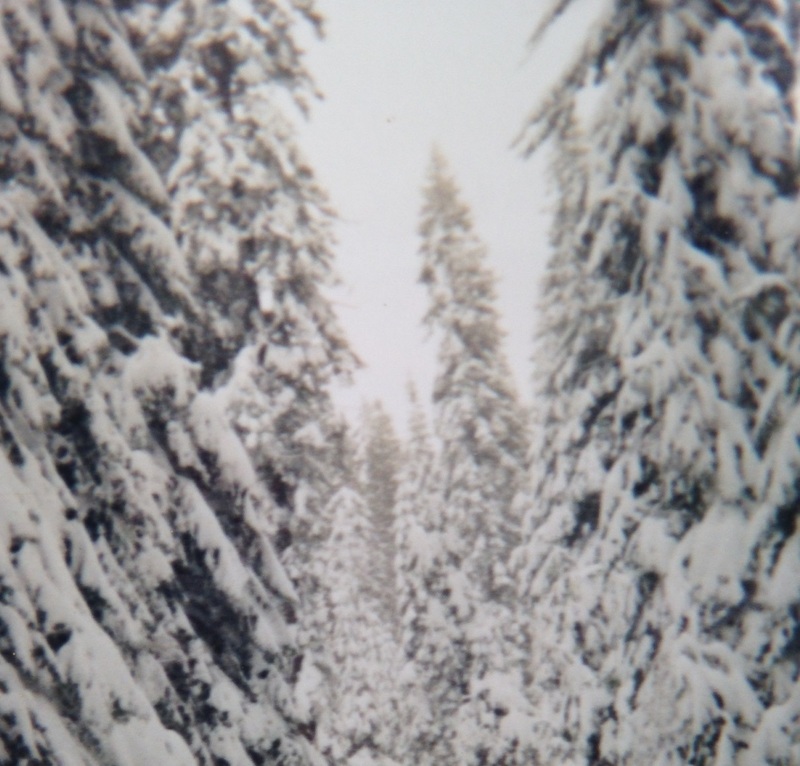 We venture across a beautiful white meadow on our cross-country skis and it begins to snow hard. The guide decides we need to stop and wait out the storm. We pack down a circle of snow, stick our skis deep into the bank behind us and drape a tarp over the entire group. The snow is coming in sideways and blowing into our sandwiches and trail mix. Some start complaining about the soggy bread and a few mumble about how tired they are. I am beaming. I’ve never seen it snow like this. The feeling becomes so big and suddenly I am crying, hot tears streaming down my frozen cheeks. “Seriously,” one of the girls says and rolls her eyes at me. On the last night, we are given a chance to eat dinner at the famous Ahwahnee Hotel. We dress in the big, shared bathroom. I feel like a princess as we walk to the hotel, my shiny black pumps slipping in the ice and snow. We walk into the lobby and it’s all wood, chandeliers, comfy chairs and an enormous stone fireplace. I start to laugh as my heels click on the hard floor, the sound echoing all around us. The restaurant has the biggest windows I’ve ever seen, wood beams crisscrossing over a green ceiling, candles in brackets along the wall, triangular-shaped chandeliers and stones that make me feel like I’ve been transported to a medieval castle. We sit at a table in the middle of the restaurant and prepare to order. “What did Queen Elizabeth order when she came here?” I ask the waitress. She tells me and I order everything the same as her, wiggling in my chair with the pure pleasure of it all. Everything tastes divine and I can’t stop smiling. The rest of the students act as if they eat artisan cheese platters and prime rib every night. They laugh at me, but I am incapable of holding back. On the return walk to the cabins, my biology teacher takes me aside. I love this man, admire him greatly, and I expect him to tell me more history or something interesting about the cabins. Instead, he takes both my hands into his and gives me a very stern look. I nod and feel my cheeks burning hot. I lower my head and dart into my cabin. I cry myself to sleep, suddenly aware at how ridiculous everyone sees me. What I view as excitement, they see as naïve. What I see as being myself, they see as wrong. It has been over 20 years since I heard those words, yet they still bring tears to my eyes. It was the moment I started to realize what being an adult meant. It was the moment I started to hear and care what others thought of me. A few days ago, I went through a car wash with my friend and his 12-year-old son. I have not been through one in years and I could not believe how fun it was. I point at the vibrant blue and pink bubbles being shot along the side of the truck. “Did you see that?” I say. The huge foam rollers smack against us, rocking us back and forth, and I giggle. I know it is just a car wash and my internal voice is yelling at me to “simmer down now,” but it sounds like a huge storm and I close my eyes and laugh. His sister is 6 and it makes me giggle more. “None taken,” I answer back truthfully. It felt good to let my joy out, to let the rush of excitement fill me up. It felt almost like Disneyland. I am tired of holding back the awe and wonder I feel every day. I’m tired of drinking to squash my feelings down. I’m tired of thinking there is something wrong with me. I’m going to take my kids through a car wash today.